To find a solution, take a look at the world of objects. If your employees need a lot of similar physical objects for work,say, gadgets or appliances, – but not at the same time, would you go for buying and storing a great deal of similar stuff? The same goes for attached files, with the difference that shared files, unlike physical objects, can be accessed and modified by two or more people at the same time. 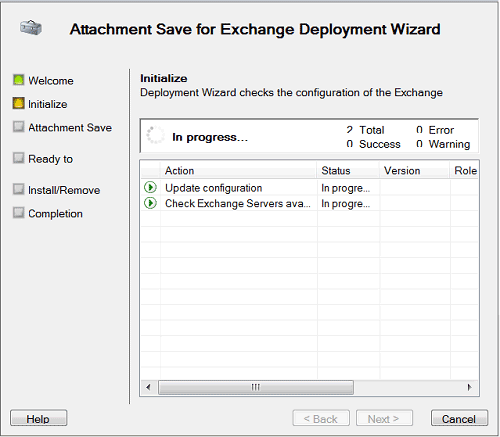 In order to optimize the flow of attachments through your Exchange server, you can make use of a specialized tool, such as Attachments Save for Exchange. It is a two-component solution consisting of an easy-to-use Management Console, which can be installed on any workstation in the domain, and transport agents that are installed on Exchange servers. Transport agents are compatible with Exchange 2003/2007/2010/2013 and Microsoft Small Business Server 2011. Thus, you can deploy the product and manage email processing of an entire organization, including the setup of Exchange servers, from a single computer or server. To begin with, it is possible to set up your Exchange server to block certain types of attachments. Attachment filtering for Exchange is not only a good idea in terms of traffic control, but is also a way of corporate policies enforcement, as you can block files that meet a number of criteria or one criterion of choice. 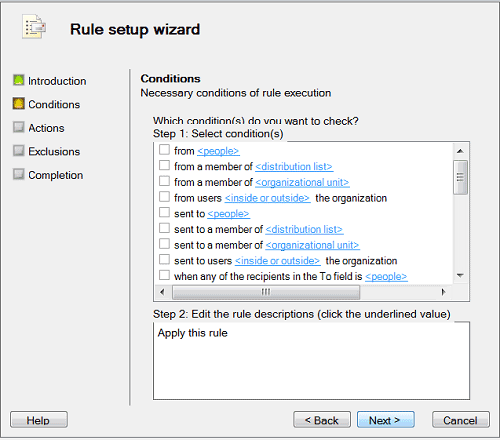 Furthermore, the solution features a system of rules with exceptions, various actions, and conditions, which makes the processing of messages and attachments flexible enough for the most meticulous administrators. For instance, attachments can be limited by size, file type, or file name; in the event of a blocked email attachment, you can have your Exchange server save it to a dedicated folder or delete it, sending a notification of denied access alongside with the original message. What is better: storing attachments in the Exchange server base or saving them to a file server or a network-attached storage? On the one hand, there is no need to optimize the storage of attachments if they are only accessed by users from within their mailboxes. In this regard, the only advantage of saving email attachments to a dedicated hard drive is saving disk space on the Exchange server. On the other hand, some attachments constitute part of business processes, for instance, bills, orders, and invoices that usually come as PDFs. In order to be able to keep track on all these documents and, more importantly, to include them in relevant databases, it is necessary to save them to a specialized folder on a local computer or file server. What is more, saving attachments to a network shared folder is a quick and simple way of granting access for all those whom it may concern. Naturally, confidentiality settings are up to you, and you can create a folder for attachments exchange that can be accessed only by your addressee and yourself. An additional benefit of storing attachments in a specified folder on a local computer or server is the possibility to apply different archiving and backup policies to emails and attachments, which can be handy in terms of search speed and data security. Next, if you need to send an attachment to a large number of in-house recipients, an automatic replacement of the attachment with a text file containing a link to the file in a shared folder is a far better option than sending the same attachment to a lot of corporate users. Thus you reduce the load on resources and save disk space on your Exchange server by decreasing attachment size, as a text file can be a dozen times smaller than the actual file. All in all, managing attachments on server level is a vital step to decreasing your Exchange server operation costs. It is a way of optimizing business processes and automating the flow of financial documentation. And finally, setting up your Exchange server for saving attachments to a specified destination and/or filtering them is easier than you think with the help of the Management Console. ← What to do if you need pop3 connector in Exchange 2013?